I started 2015 firmly with the belief that sprint distance racing was what I was best suited for. 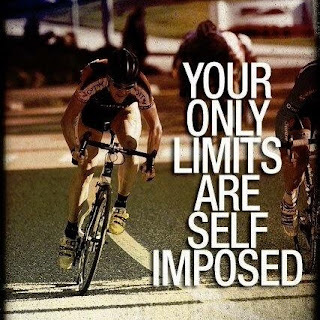 Over the previous two seasons I have dabbled with every distance from supersprint to Ironman but towards the end of 2014 I realised I performed better when racing sprints. So this year was firmly about learning to race. After having competed in 18 different races this year, I am absolutely exhausted and am currently relishing the 4 week break from training. I am still doing the sessions I enjoy (mostly swimming and functional movement) but it is nice to be able to relax after a long tough season. My build for 2015 started in December 2014 so it has been a long season between that and my last race on 11th October. How has the season gone? Well in all honesty, better than I wanted it to. Despite one broken arm sustained in April, which could have written off a lot more of my season than it did, it has gone better than me and my coach planned it to. We set some targets last November and I am performing ahead of those targets (or was when I was training). These were metric based targets set for the next two years and I am currently ahead of the where I need to be. 22:15 for 5km. My current PB is 22:00. 379W for MMP. My last test was 421W. On top of this we also set a goal for the season. Finish within 120% of the winner in my AG at a sprint distance qualifier to be able to be selected fro GB AG next year at the ETU champs. I managed to secure 118.3% at Southport after my arm break so was over the moon. And now for the goal I set myself. Complete a pool sprint triathlon in under 1 hour. Yes this was an ambitious target but I selected a race I knew and had broken it down in my head and it seemed achievable. Tight but achievable. In my head I broke the race down as follows at Drax before the race. 22:59 for the run to bring me in with one second to spare. I swam the swim relaxed and exited the water in under 6:00, made my way to T1 and mounted my bike without any issues. On the bike I needed to average 22mph for the course to come in under 30 minutes. Despite my best efforts and my screaming quads I could not get my average speed above 21.2mph and completed the bike in 31:43. I flew through T2 and set about the run. I had forgotten how tough the off road portion of the run was and was thrilled with my 23:21 run split. I crossed the tape in a PB time of 1:02:35 (an over 2 minute PB) but was somewhat disheartened about my bike. Had my bike been where I wanted it to be, I would have been really close to going under the hour. So with that in mind I will be back next year to go under the hour. By far the biggest highlight of my year was my 7th place finish at Hatfield. Seventh. Me!!!!! WTAF!!!!! I’m still shocked by this and think this was my perfect storm race. Everything just seemed to go right. I swam relaxed despite being dropped from the pack but managed to exit the water first., I biked strong and surprised myself on the run. All in all I will look back on 2015 as a great season, it was where I found my distance, where I learnt to race, where I became a better coach for my athletes at Doncaster Triathlon Club and where I surprised myself with what is possible. In summary here is my palmarès for 2015. Whats on the cards for 2016? More of the same. Improving as an athlete at sprint distance, aiming to qualify for GB as an age grouper, more weight loss, continuing to surprise myself and making my family (alive or not) proud. 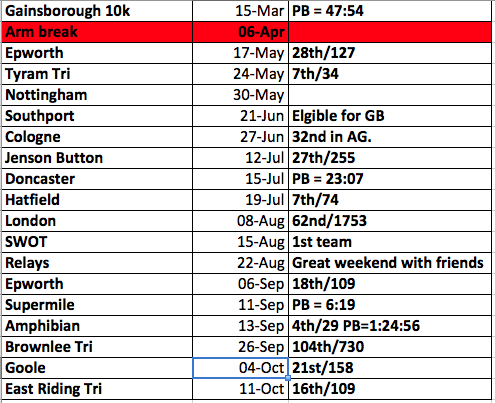 The race calendar is currently being formed but I suspect there will need to be a double peak next year with me wanting to qualify for GB and wanting to break the hour at Drax.